One of the things I love about learning is the way it shifts over time. Thinking about my time in graduate school made me realize how much of that experience I’ve carried with me and applied to my career, often not even realizing it. Here are few lessons I’ve carried with me from my social work training that serve me well as an evaluator and may be useful others. 2. Honor beginnings, middles, and ends. This one is directly from the Penn Approach to social work practice and comes from the work of Otto Rank, a member of Freud’s inner circle. Honoring beginnings, middles and ends acknowledges that time is an important aspect of professional practice and helps match expectations to a given situation. The three words also serve to remind me to stay present, pay attention, and notice when a beginning turns into a middle or a middle becomes and end. We move through life so fast we can forget to notice what’s happening. This mantra slows me down. We “honor the end” any time we take a break before starting the next adventure, meeting or book. It is so simple, but thinking this way can be profound. Employing this takeaway involves a shift of perspective more than anything else. Social work has great tools for reflective practice. The one I dreaded in graduate school and have come to love is the “process recording”. Basically, after a meeting with a client, a social worker writes down as accurately as possible everything that was said and everything the social worker thought and felt. A complete example PDF is available here. Planning to write in this way makes one very present during an interaction- a good practice in itself. Writing the process recording gives space to reflect on observations, feelings, thoughts and applying theory in practice. Even done in isolation, it can be excellent exercise for improving one’s practice. Sharing a process recording with someone else welcomes feedback and provides a second opinion. If you’re planning to share your notes with someone, make sure it is a trusted colleague who is on board with learning together in this way. It’s evaluative, revealing, and personally and professionally challenging. Gentleness is key with this practice. It is about noticing, reflecting and learning, not judgment. 4. Be a voice for the silenced. I almost wrote “be a voice for the voiceless”, and that is not at all correct. Everyone has a voice and a story, it’s just that some voices are more likely to have a seat at the table than others. How to act on this one varies depending on the situation. Raising the issue yourself can work, provided you’re prepared to do so and ready for what may happen as a result. Other times it is possible to include a champion on the team whose voice will be more influential or informed. A private conversation after a meeting can change the nature of the next interaction. A caution is to avoid tokenism or fall into the trap of thinking one person’s opinion or experience represents an entire group. This holds whether the group is microbiologists, military moms or multilingual merchants from Manitoba. Small gestures can be meaningful, too. I once wrote this quote on the board in a meeting where I wanted myself and the group to be especially conscious of the people who provided the data we were talking about. It’s not that we wouldn’t have paid attention naturally, but I wanted it to be explicit. It didn’t occur to me at the time, but I’m fairly certain my social work roots were in action. That’s another lesson from social work training. The small stuff matters. Sometimes we never know how much. Happy Social Work Month to all the social workers out there! 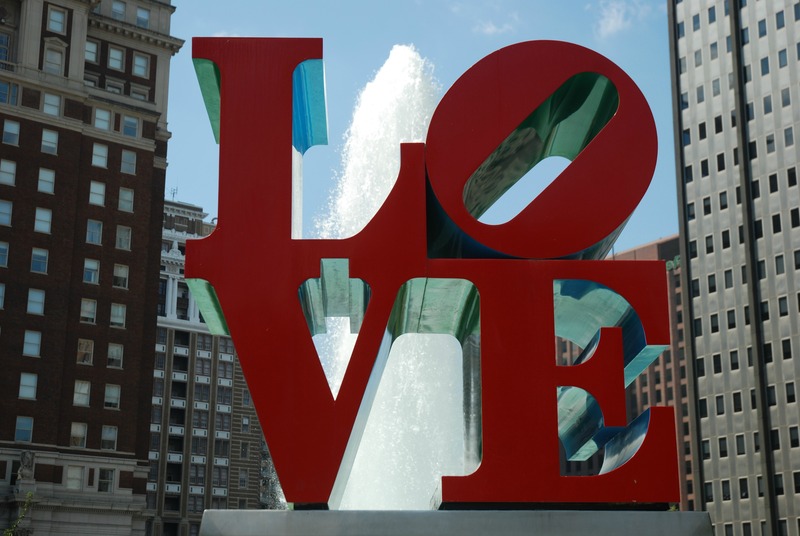 Here’s a little love (again) from Love Park in Philadelphia. It’s Social Work TIG week over on the AEA365 Blog and I hope people have been reading. I’m glad to see Kathy Bolland calling attention today to the common values held by both social workers and evaluators. Those values are what drew me to these fields. What social workers and evaluators do is different, but there is a lot of overlap in why we do what we do. I love social workers. Social workers are brave warriors for justice, compassion and positive change. They go places and help people most of us feel uncomfortable even thinking about. Social workers move towards others’ pain the way firefighters run into burning buildings- armed with training, experience, tools and hopefully an “I trust you with my life” backup team of colleagues. Evaluation work is infused with emotion, too. It has to be because we work with people. Often, it feels to me like evaluation over-sciences the emotional nature of our work out of a commitment to objectivity. When we use objectivity to distance ourselves from connecting with people in an authentic, deep, meaningful way, it is a disservice to ourselves, the profession and our clients. We can be objective with the methods and data while being living, breathing, subjective human beings. If we didn’t care about our work we probably would do something else. I know a little something about social work because I earned my Master’s degree in social work mumbledyteen years ago from the University of Pennsylvania. I have often felt conflicted about my social work credentials because I only worked in typical social work settings in graduate school. So, I am not a “real” social worker. At the same time, I occasionally don’t feel like a “real” evaluator, either. The most acclaimed evaluators have doctorates and that seems the necessary credential. An MBA is also OK, if you’re doing consulting work. Why there are not more MSWs working in nonprofit consulting firms is a question I’d very much appreciate having answered one day. The subtle, unspoken message is that the MSW is “softer”, “squishy”, “less than”. Let me tell you, there there is nothing “soft”, “squishy”, or “less than” about having a client come terrified into your office trying to hold it together when her son has just been accidentally shot playing with a gun, or answering questions from an HIV positive mom with two kids and a 4th grade education about how she is going to be work ready in 5 years. My entire training in social work was about having my heart broken open, sharing pain, and finding the personal strength to sit and be present and do my job. I learned to draw on theory to inform my practice in a room of people experiencing turmoil. Excellent training for real world evaluation (and probably management consulting, too). I grew up a lot in my two years of graduate school. Desire for growth was part of why I chose the program I did at the school I did. I wanted my world view challenged. I wanted to be a bit scared. I wanted to put myself out there. Anyone who has taken a yoga class knows about the importance of stretching to your own limits (but not beyond), again and again and breathing through the discomfort. Social work training, for me, was like taking an advanced course in emotional yoga. Instead of stretching muscles, social work training was about stretching our hearts and minds. Some days, due to circumstances beyond anyone’s control, our hearts were shattered. We knew this was part of the deal and did it anyway. Sometimes it amazes me that I purposely put myself through that experience. There were times when it was all too much. I feel like I took what was, for me, the “easy” way out by focusing my second year on the comparatively comfortable world of social work research and evaluation. And then I remember doing a lit review on outcomes for girls in juvenile delinquency settings and working on an evaluation of a state child welfare agency. Data and numbers were not so easy then. Those were real kids with real scars, real tears and real dreams. Not the kind of data we worked with in stats class at all. I didn’t let myself get swept away in the real tragedies behind the data, at least not during the day. I drew inspiration and made sure my work was correct, valid, complete and the best it could be. I processed the reality of the data in my journal and through conversations with fellow students. I don’t practice social work any more and probably never will. However, I do try to practice what social work taught me. Maybe it’s that I’m getting older, or braver, but I find myself wanting to be closer to the problems of the world rather than further from them. I forgot for a while that letting my heart be broken by the suffering in the world also allows me to feel it’s joy. Social work helped me learn that and I’ll be forever grateful. Social work is not Quixotic windmill jousting. Don Quixote is one of my favorite heroes, the Impossible Dream one of my personal theme songs. I listened to that song more times than I can count while I was at Penn. It kept me going; it gave me hope. It still gets me every time. On my bravest days I don’t even come close, but I deeply believe in that song’s message and those who aspire to it’s vision. Thanks, Social Work TIG, for giving me an excuse to “out” myself as a former social worker and for talking about the valuable insights social work has for evaluators. One week isn’t enough to cover it all. Tomorrow I’ll share a few more lessons I learned from social work that may be useful to other evaluators.